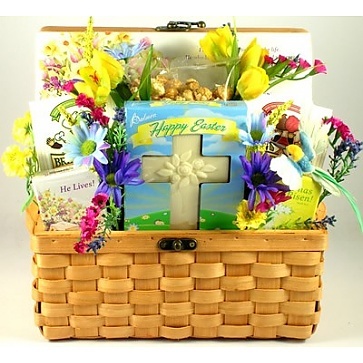 Celebrate the true meaning of Easter with this lovely Easter basket that captures the spirit of Easter! "Happy Easter" molded White Chocolate Cross! They will love this treasure chest filled with a lovely bird, a stunning arrangement of springtime silk flowers. This gift is a very special way to celebrate the true meaning of Easter while letting them know that they are in your hearts!